LiveCode LessonsLiveCode LessonsHow To - LiveCode Mobile Tasks LiveCode Mobile TasksHow do I implement a multi-touch pinch motion? The pinch motion that you find in many iPhone apps is known as a 'gesture'. Apple don't provide support for specific gestures such as pinch leaving us as developers to implement them ourselves from touch messages. This does mean we have to do a little math but we'll work through that together in this lesson. The pinch gesture is often used to shrink and grow items like photos. 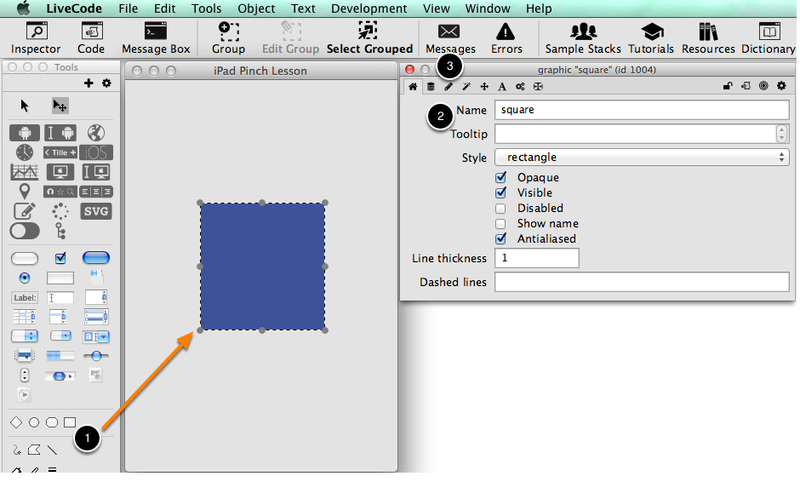 In this lesson we'll use the pinch gesture to scale a plain graphic. * The image scaling algorithms in LiveCode have not been optimized for the iPhone yet meaning that dynamic image scaling is quite slow on the device. So in this example we are scaling a graphic which is very fast. We're going to leave the interface for a moment and look at the basic messages we receive from Rev when touches start, end and move. If a user places two fingers on the device, two touch starts messages will be sent to your stack. You will also be sent a touch ID so you can tell they are different. Copy this script to the card or stack. 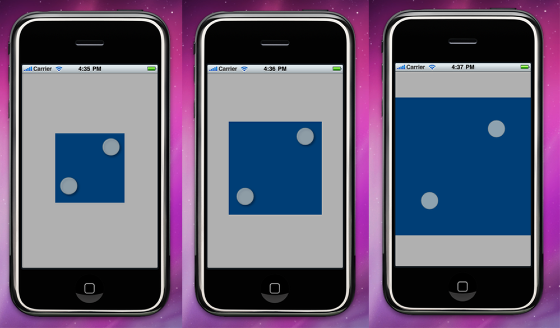 3) Click and drag to simulate touches moving apart / closer. The square will shrink and grow accordingly. Does LiveCode support the use of the alt key when trying to simulate multitouch in the simulator? I cannot get it working. Thanks. 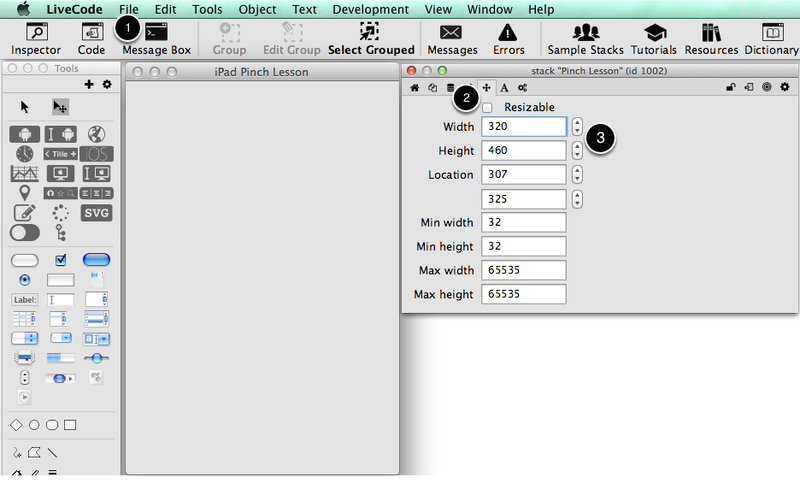 yes you can simulate multi-touch pinch using the alt key in LiveCode on the iOS simulator. If you download the sample stack that accompanies this lesson and run it without modification, then you should get the results shown in the last section of the lesson. The white circles are the locations at which the two touches are simulated. Looks like you're missing a lock screen in your resizeGraphic handler. Works ok on mobile, but how do we do this on a windows platform which native supports multi-touch? I exported as a windows exe, but it does not work with a multi-touch 4K screen. Only a single mouse touch. So how can we do this? Thanks for any help. If you would like to you can add your email address to the CC list to get email updates when the status of the bug changes. This works really well, but is it possible please to modify the code so that dragging 2 fingers moves the square instead? i.e dragging moves and pinching scales (and for bonus points twisting 2 fingers rotates)? The code could be modified to behave this way, you can change the logic in the touchMove handler to decide what type of gesture it is. Thanks Elanor for your feedback. I have managed to get scaling and moving by adding just before the resizeGraphic call an IF statement to grab the object if the resize distance is unchanged, i.e. A bit glitchy but it works at least :-) Do you have a better approach? That seems like a good approach! You could only call resizeGraphic if the size has actually changed, but thats the only change I would make e.g.